Exploring Music as Worship and Theology addresses a central challenge to liturgical scholars and pastoral leadershow to understand the diverse, culturally shaped worship patterns that exist in our multi-cultural church. It situates music as a central lens through which to explore a community's liturgical practice, and offers a practical method for studying and interpreting the lived experience of a musical-liturgical assembly. Exploring Music as Worship and Theology invites greater attention to the diverse cultural music emerging in our various Christian assemblies, and underscores the need for greater dialogue between our theories of liturgy, music, and the actual practice of local communities. Mary E. McGann, RSCJ, PhD, is assistant professor of liturgy and music at the Franciscan School of Theology at Berkeley. She is co-author with Edward Foley, OFM Cap, of Music in the Eucharistic Prayer published by The Liturgical Press.
. . . an important book for those who work in the field of liturgical studies. 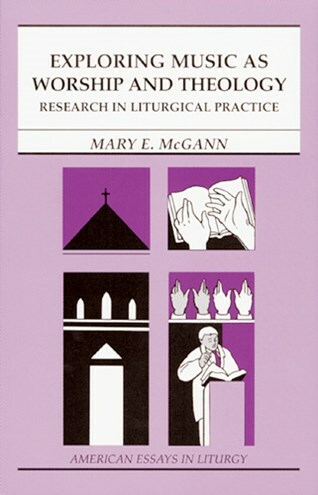 In a clear and engaging manner, Mary McGann makes a significant contribution to the topic of method in liturgical theology by offering an interdisciplinary approach for studying music as liturgical performance. Drawing on theories from the fields of liturgical studies, ethnomusicology, and ritual studies, she offers a new model for incorporating empirical field research into liturgical theology, one which allows music to be explored as a theological act.
. . . offers new insights and wisdom on Christian faith and practice as expressed in Christian music and music making.
. . . makes a significant contribution to the pastoral imperative of liberating our liturgical celebrations from the rigid patterns imposed by the rubrical priorities which for centuries have been accepted as the absolute standard and norm for liturgical worship. Recognizing this rubricism 'had all but dried up our liturgical imagination,' McGann offers readers the fruit of her work with an African American Catholic community. Her observations have far-reaching implications for the authentic inculturation of the liturgy in our multi-cultural world. Rigid models cannot meet the needs of this pastoral reality. McGann's methods can aid liturgical leaders to embrace this imperative with fresh insight and much-needed imagination.
. . . offers a method of exploring music as worship and theology that goes far deeper than many people are accustomed to using . . . is not merely for scholars but could be used . . . for parishes, especially by music directors, diocesan personnel, or synods. This small volume will be a useful guide to those interested in doing empirical field research in the area of worship music. McGann draws on three fieldsliturgical studies, ethnomusicology, and ritual studiesto distill for us the foundational role of music in liturgical life. Even more significantly, she articulates its theological import and potential for ritual communities today. McGann brings both expertise in all the theoretical literature and much practical experience to this new frontier in pastoral liturgy. And it is on the fluid frontier of how we worship that theology in this century will have to find its footing. McGann points the way.
. . . a truly interdisciplinary and integrated method and research process for studying and interpreting what occurs in the lived liturgical experiences of our faith communities. Professor McGann's book is also a much needed resource as we now take more seriously the task of articulating a plurality of liturgical theologies that actually reflect the diversity of these communities. As the U.S. Church increasingly becomes a community of immigrants and refugees, we have a choice on how to welcome this new diversity among us. Will they be forced into American standards of liturgy or will there arise a mutual respect and interchange? Mary McGann's work, moving from theory to pastoral practice, offers fresh ritual and liturgical insights for our changing times. Ultimately, her work will assist pastoral musicians and liturgists in breaking out of Western-European attitudes toward music making and ritual. Her concerns and procedures offer a path out of dominant culture thinking and open rich possibilities for the Church of the 21st century. In an era when much writing about liturgy and music betray little more than authorial bias, it is refreshing to read a work stepping back from the culture wars' to concentrate on method. . . . Required reading for seminarians and clergy, for graduate students in liturgical studies, and for Christian music ministers.
. . . a wonderful guide for imagining a church where theology and practice cooperate, where the richness of cultural and experiential diversity informs all liturgy, and where academic study is done with integrity and inclusivity. All this is presented through the medium of liturgical music which opens the door to expansive possibilities using precise and practical suggestions of how to understand the many meanings that ritual and music play in the expression and creation of the Body of Christ.